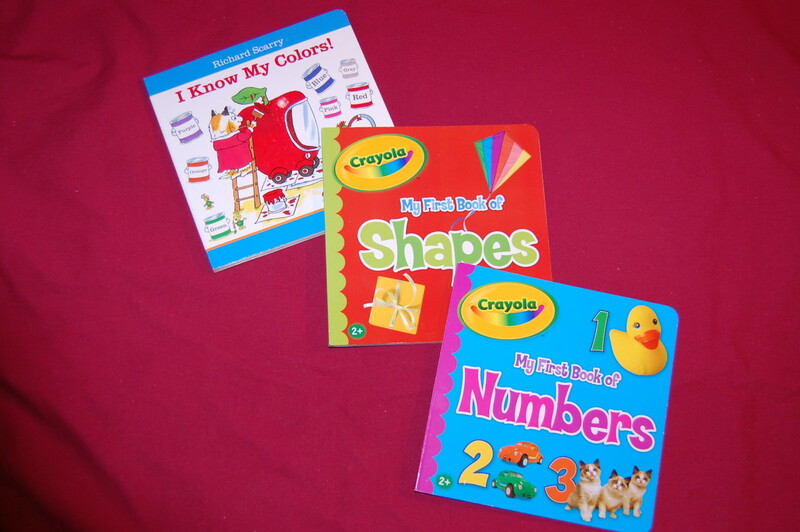 Before young children can identify or name colors, they can sort by color. By that I mean they can identify objects of the same color and group them together before they can tell you what those colors are. According to the American Academy of Pediatrics, most children are not expected to know four basic colors until age 4. Pre-school activities, therefore, should include sorting by color. 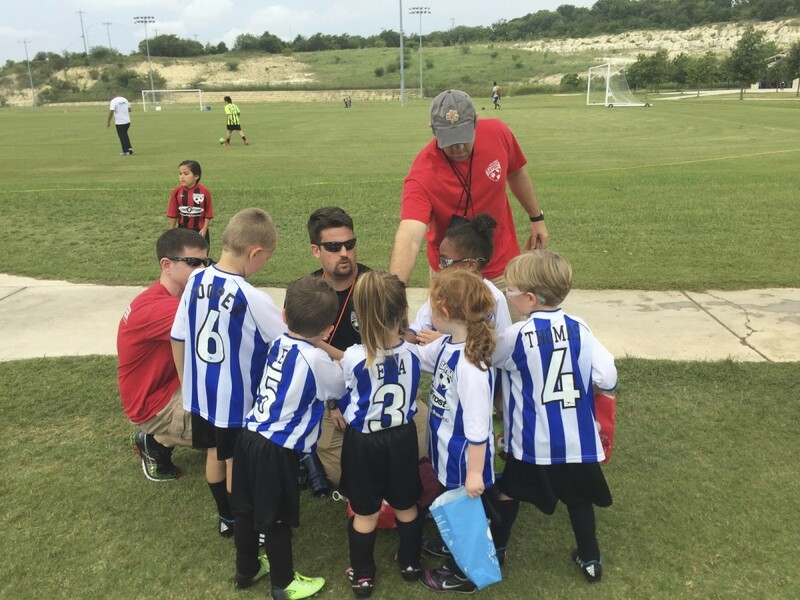 Regardless of age, if your child does not know colors, then work with him or her on recognizing and grouping items together that are the same color. I am sharing my favorite pre-school activities (with personal photos of my actual gear) for working on color recognition and sorting by color with young children. In my practice as a Pediatric Occupational Therapist, and supervisor of Occupational Therapy Assistants, I use these activities frequently with older children with delays, like some with autism or mental retardation, or otherwise with delayed developmental skills. Regardless of diagnosis, we are trying to facilitate normal developmental milestones. Doesn’t get much easier and cheaper than this for having an activity for color sorting. I bought poster board in red, blue, yellow, and green. My sister cut out about 8-10 circles, squares, and triangles in each color. She then laminated them at my clinic. I usually start working on color sorting with the red and blue circles. I place one red and one blue circle about 12” to 18” apart, then I place 1-2 additional circles for each color as an example. Have the child place 4-5 circles for each color. If the child can sort red and blue circles, you could then try 3 or 4 colors, but stick with the same shape. 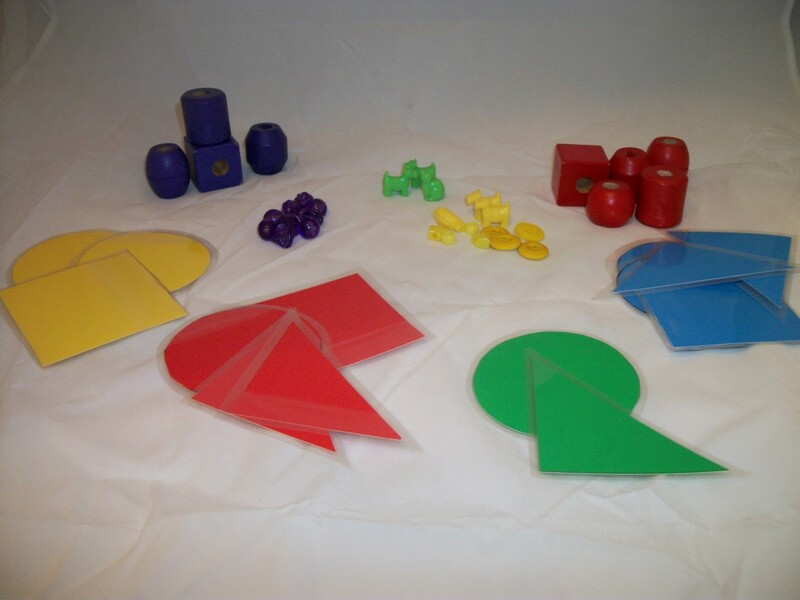 As the child progresses, you can then try multiple shapes for each color. 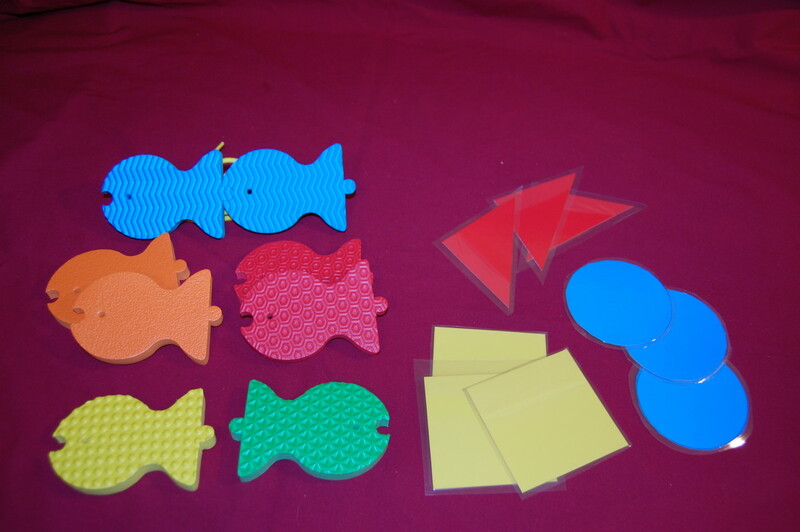 These foam fish have upper or lowercase alphabet letter on one side, with the entire alphabet covered. They come in 6 colors, red, blue, lavender, orange, yellow, and green. 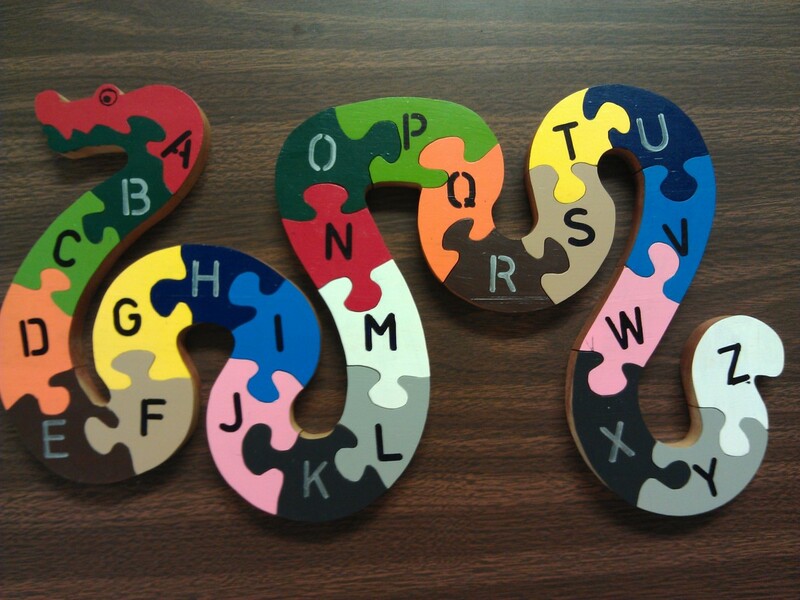 They snap together like interlocking puzzle pieces, so the child can spell words. They have holes and string for lacing. 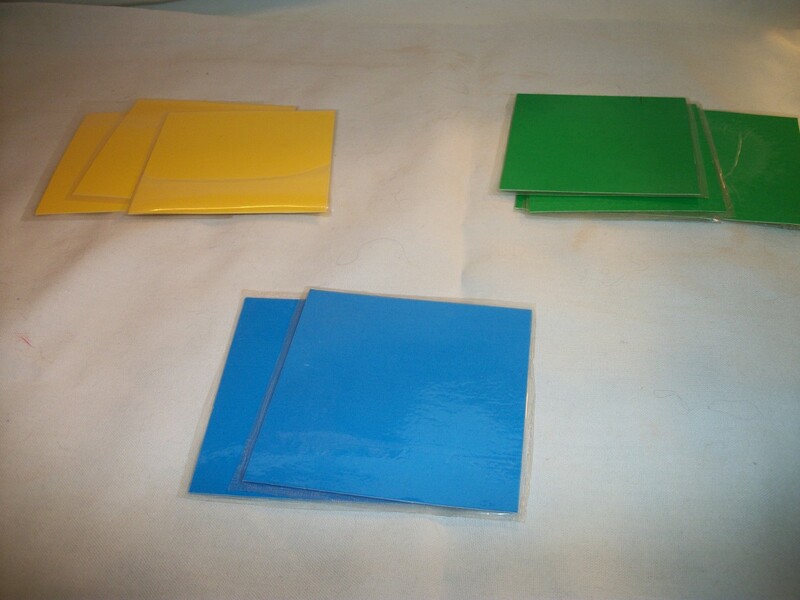 Letter and color sequencing cards included with the set. 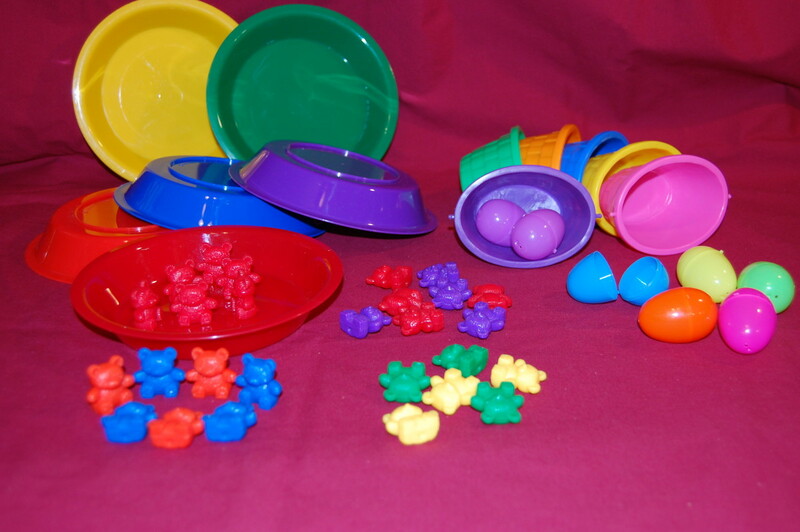 To use fish for sorting colors, sort into piles (as for laminated shapes above) or sort into baskets of matching color (as for eggs below). This is my most successful activity for sorting colors. Even my lowest functioning autistic kids will usually do this activity, even if they have refused all other color sorting activities. My eggs are smaller than the typical Easter eggs. I got the 6 baskets and 6 eggs of each of the 6 colors from Goodwill for about a dollar. I lay out all of the baskets, and place one egg in each matching colored basket. Give the child one egg at a time to place in the corresponding basket. If the child seems confused with all of the baskets, you can present only 2 to 3 colors of eggs and baskets. I love my Bears & Bowls! They come in 6 colors. You can get them with coordinated color bowls or cups. You can also get sequencing cards to copy. My only complaint is the red and orange colors are too similar. I use my bears for activities to learn number concepts too. I package my bears in Ziplocs with two colors per bag. For example, blue and purple, red and yellow, and green and orange. I start with 10 bears in each of 2 colors and have the child sort the 2 colors into the correct bowl. I may then give the child 2 more colors to sort. Once I know the child is successful with 2 colors, I may start the next session with 3 colors, but still sticking with 10 of each color. You get the idea, increase number of bears &/or the number of colors as the child progresses. I have a small Lauri foam pegboard and pegs, which come in 5 colors. You can get much larger pegboards, but for young children, I think the small pegboard is perfect. The pegs will stack into each other. 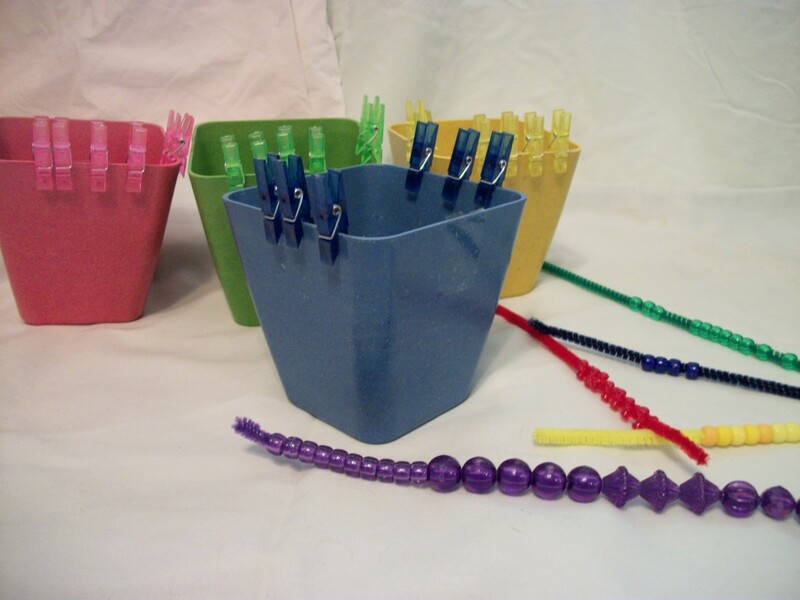 Many of my clients enjoy making “swords” with the pegs. My only complaint is that autistic children are sometimes bothered that there 36 holes in the pegboard, but only 25 pegs. All in all, this is a very useful tool, at a very reasonable price. I love my Quercetti pegboard. This is another activity I can get even my lowest functioning clients to engage with. There are 48 pegs, with 12 each of red, blue, yellow, and green. There are 16 patterns to match, on 8 cards. On one side of the card is a simple picture like a ladybug, a dinosaur, and a house. On the other side of the card there are simple geometric designs. The geometrics work best for younger children. The storage tray for the pegs is divided into two compartments. I have the kids put the red and blue pegs on one side, and the yellow and green on the other side. 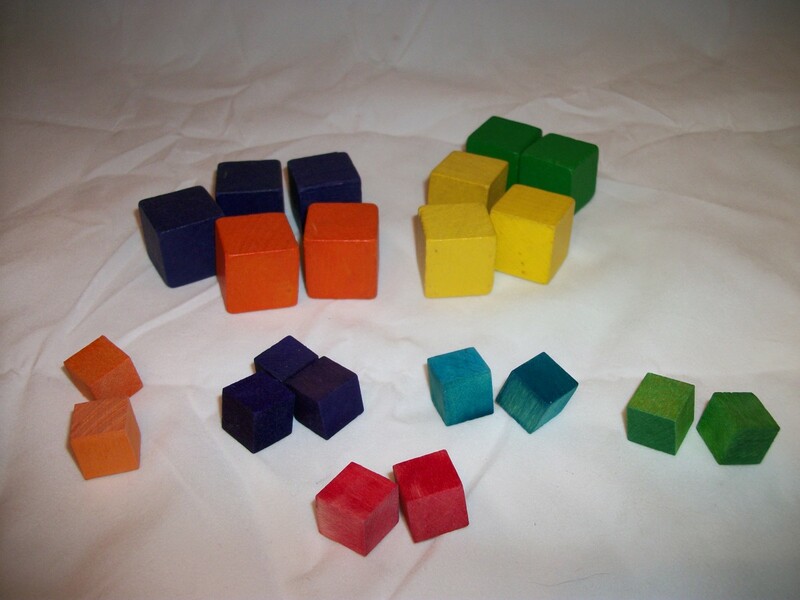 Most Occupational Therapy clinics have colored one-inch cubes. 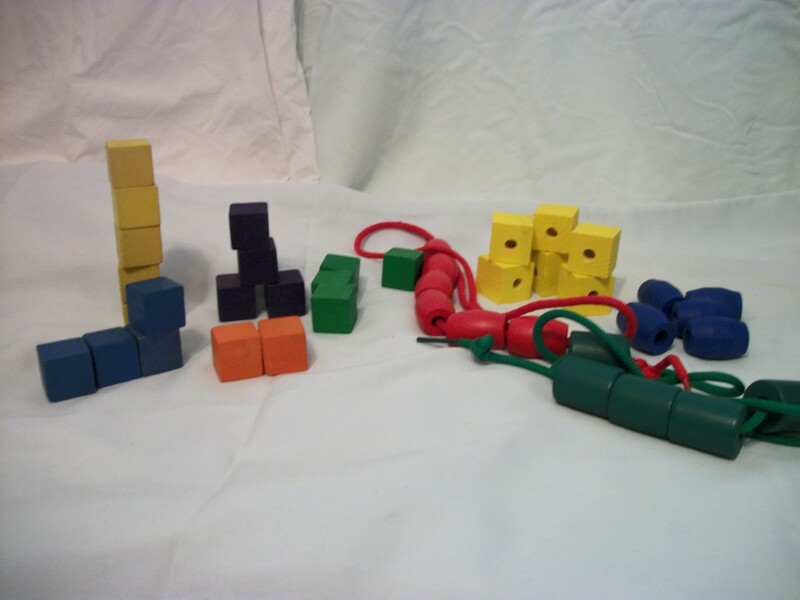 These cubes are used in a lot of pediatric assessment kits. They come in bright colors. Card sets are available for design copy. Some designs are 3D, but for others you can imitate the design by placing the cubes right on the card. I also have a set of brightly colored half-inch cubes that I got from Hobby Lobby. You may also be able to find ¾” or 1” cubes there too. Have the child separate the cubes into colors. You should start out with 2 or 3 colors, with no more than 10 of each color. I have the Melissa & Doug Primary Lacing Beads. The set consists of 30 large beads, ¾” to 1” in 6 colors, with 5 shapes of each color. You can have the child separate the beads, putting all the reds together, all the blues, all the greens, and so on. Lacing string is included, so you could have the child make a necklace with only the purple beads, only yellow, etc. I bought large colorful beads at the dollar store. 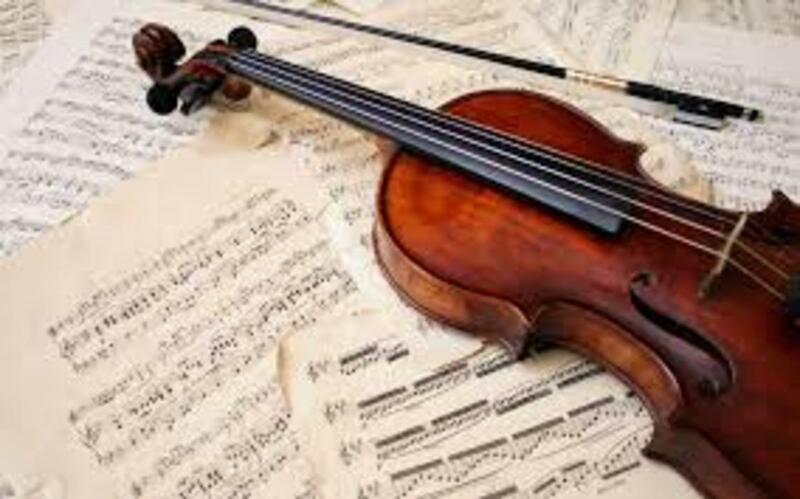 They are fine for sorting, but the insides are not sanded, and the string gets caught and will not go through. But you could buy 2 packs and have plenty of beads to sort. 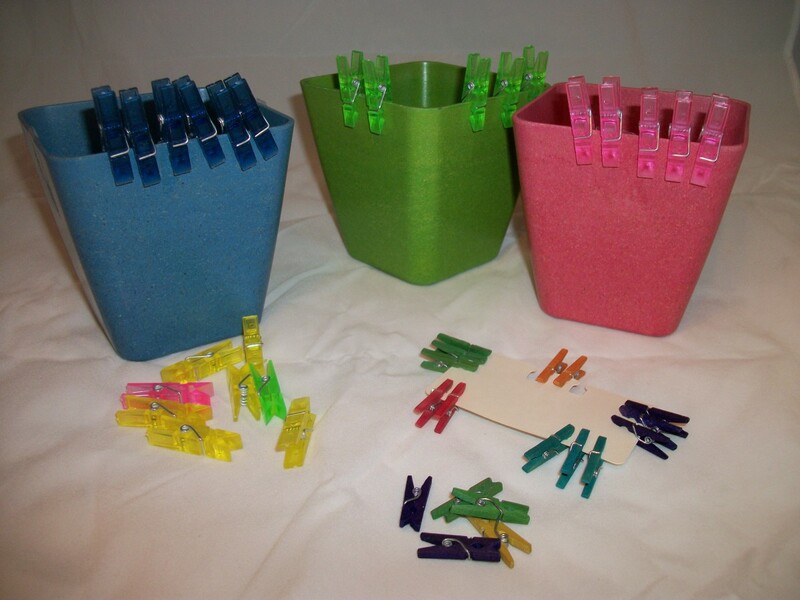 I have colored plastic mini clothespins that I love because the kids love them. I bought a package with two dozen pins from the dollar bin. I usually have the kids clip them onto the rim of a plastic bowl. I found that most kids automatically segregated the colors. I also have a set of tiny wooden colored clothes pins from Hobby Lobby. This is another inexpensive activity. I bought a package of pipe cleaners, or chenille sticks from the dollar store. I fished out colorful pony beads from a bead assortment that a friend gave me. 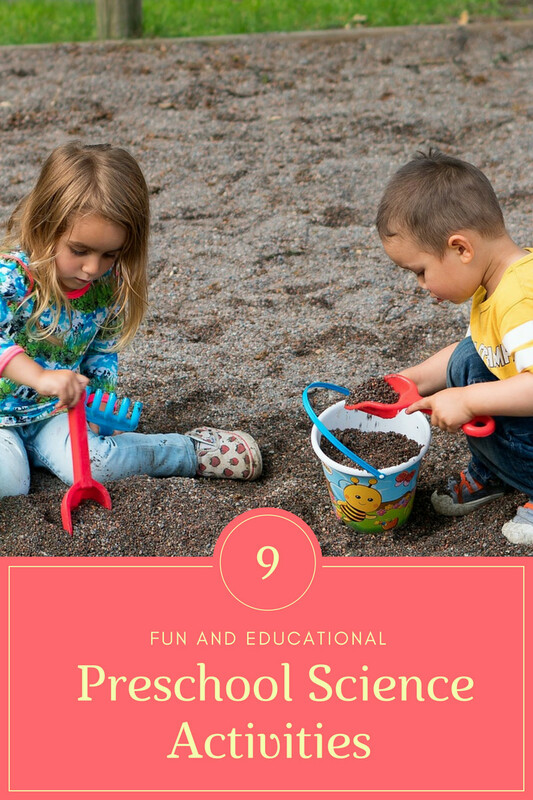 This activity of course requires more fine motor control than the other activities. If the child is easily frustrated, and does not handle small objects well, this is not the activity to use. 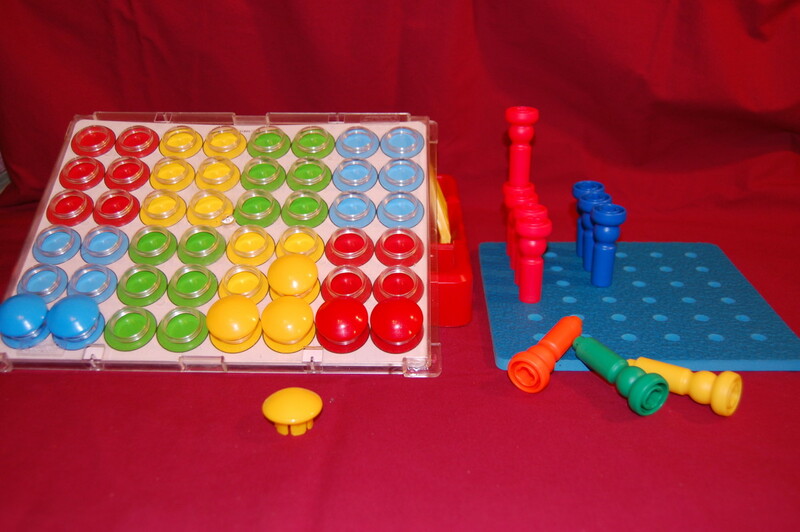 All kids seem to love Connect Four, whether they know how to actually play the game or not. I have young children place the chips, sorting into red or black rows. One of my COTAs (certified occupational therapy assistant) spray painted the chips red, blue, yellow, and green, and has kids sort the colors into different rows. 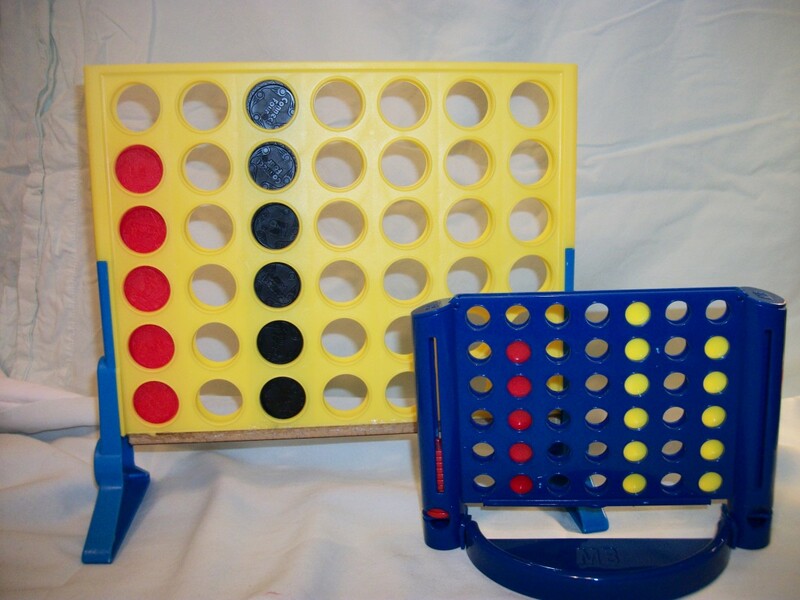 I also have the travel sized Connect Four. It may be better suited for small children as the chips are smaller for small hands, and they don’t have to reach as high to put the chips in. Of course, as with any activity with small pieces, this game should not be used with children who tend to put everything in their mouths. 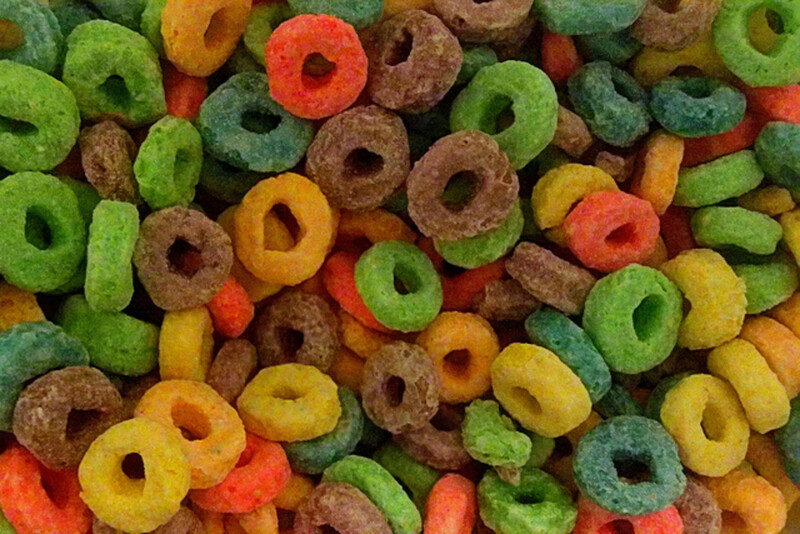 You could have the child sort colorful cereal, such as Fruit Loops. Get creative and make a face or design in frosting on a cupcake or pancake for the child to copy. Use specific colors to make a design, or just make rows of each color. I got the Sorting Pie in 2011, and still use it often. You can sort the fruits into 5 colors: red, purple, orange, green, and yellow. 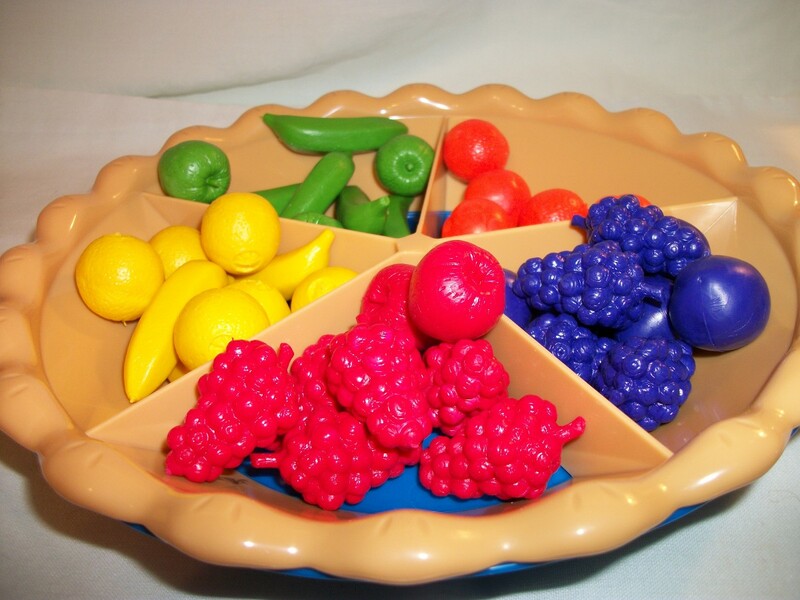 Once the child masters colors, they can progress to sorting by fruits: bananas, berries, apples. There are plastic tweezers for fine motor practice with tool use, but the child could certainly use their fingers. I also use it for number concepts. I have several children’s books about colors. Some books are simply about colors, while others are children’s stories that just happen to incorporate colors into the story. Reading about colors in a children’s book, and discussing the book can be a pressure-free way for a child to learn about colors. 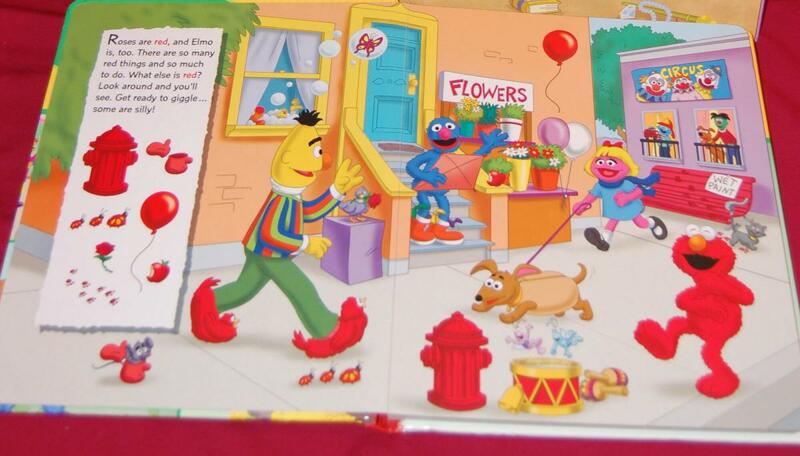 I have a Sesame Street Look and Find book that features color concepts. All of the items to find in each scenario are in the same color. 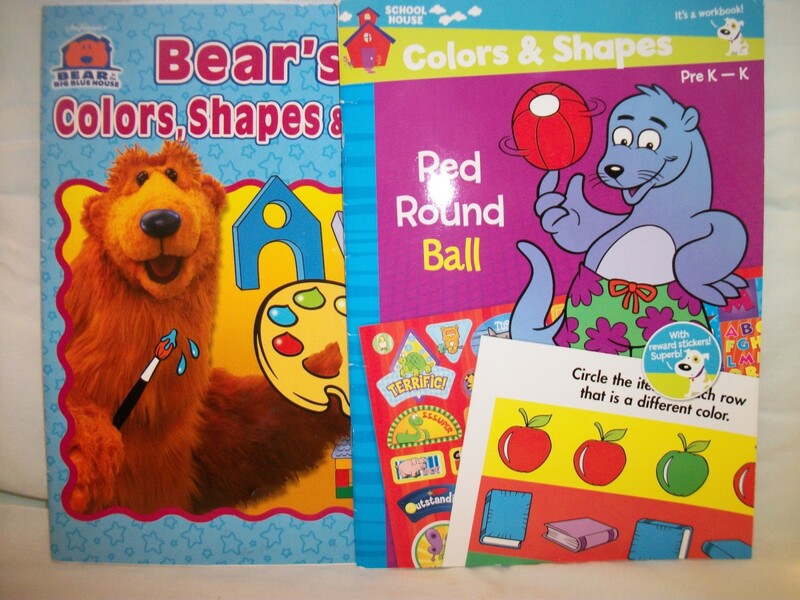 You can also find children’s activity books that feature colors and strategies for learning colors. I have lots of photos of activities to facilitate various developmental skills in young children. What other topics would you like to see? Thanks so much Esmeowl. I hope to continue publishing peds articles. I have lots of photos from my PowerPoint presentations to staff. These are fabulous ideas. As a former kindergarten teacher, my favorites (and the students) were sorting the colored bears into the cups. Voted up and useful.